A template is in development, when it hasn't been published yet. A template can always have the state 'being tested'. Then you can view the template like the learners will see it. You can also find the template as a tile under 'Home'. By clicking the More button, you can stop testing. 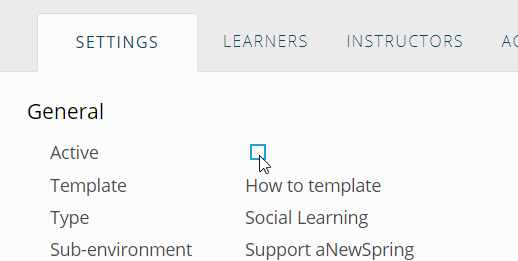 When a template is published, you can create courses and subscribe learners. If you have templates or courses that are not in use anymore, but you do want to keep them, you can archive them. To do this, you will first have to set the course to Inactive. You can do this by unchecking the option Active when you go to Settings. Next go to the overview of templates and click More and then Archive. After this, you can do the same for the template. If the course is inactive, learners can't follow the journey anymore, but they can still view their results at Home. They can't do this if the course is archived. You can easily filter templates and/or courses with a certain status using the filter feature. What can't be changed anymore after publishing?